In a small mixing bowl, stir together the tuna, mayonnaise, red onion, celery, Dijon mustard, and salt and pepper. Mix until combined well. Soften the flour tortillas by heating in the microwave on high for 15-20 seconds, or wrapped in foil in a 325℉ oven for 7-10 minutes. Arrange half the lettuce off center on one side of each wrap. Top each bed of lettuce with half the tuna mixture, one piece of roasted red pepper, and half the avocado. Sprinkle with the feta cheese. 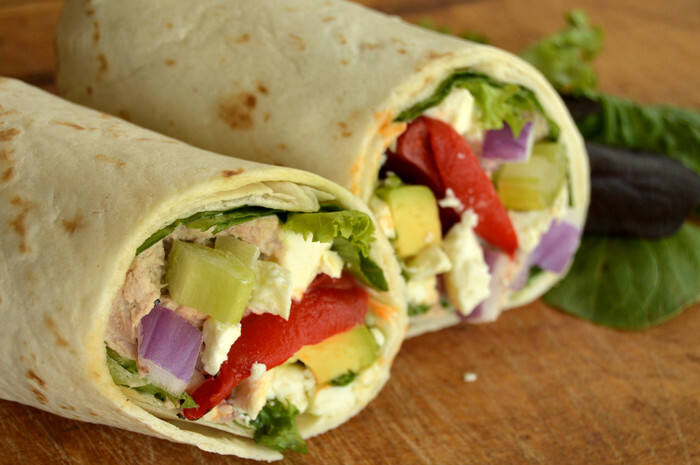 Roll up each wrap by folding in the sides of the tortilla first, then rolling in from the side with the toppings. Cut the wraps in half to serve.